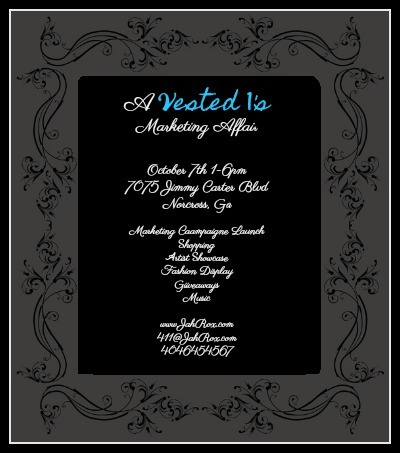 Join us for A Vested 1's Marketing Affair! The Vested 1’s Marketing Campaign focuses on shining a bright spotlight on outstanding individuals that have taken the faithful step of investing in branding themselves. Our mission is to create a platform of brands supporting brands. Whether you are selling products, talents, or services we are all connected by our goals of taking our wildest dreams and building them into our outstanding realities. Click here to read full announcement! This is the first of many, Vested 1’s events. We are looking for some really fly vendors to be apart of our event. As a vendor we will add your business information and your logo to JahRox! A Family Affair. You will get an onsite interview so you can tell the world about your business. Also, we will add your business name and web address to all event advertisements.